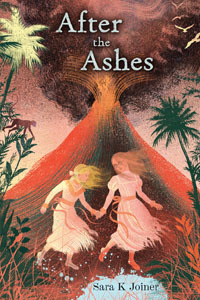 In this riveting coming-of-age survival story, a stubborn and intellectual teen must fight for her life when the mighty volcano Krakatau erupts and puts her hometown on the Javanese coast in mortal danger. In 1883, on the island of Java in the Dutch East Indies, thirteen-year-old Katrien Courtlandt is determined to prove Darwin's theory of natural selection. Unfortunately, nothing causes her Aunt Greet more angst than Katrien crawling around the muddy jungle collecting bugs in the name of science — and in the company of a native boy, no less! If only Katrien would take an interest in running a household and making friends with other girls. But Katrien has no interest in changing, especially if it means socializing with the likes of mean Brigitta Burkart. Then, one stifling afternoon, Katrien's world turns upside-down when the nearby volcano Krakatau erupts with a terrifying blast. For days, a deathly ash rains down on the Javan coast, and everything is soon buried under the dust or destroyed by the tsunamis that follow. Amidst the chaos, Katrien knows her only hope of survival is to flee the jungle with the one person she vowed she'd never befriend. Set against the backdrop of one of the most spectacularly horrifying natural disasters in human history, this debut novel is by turns exciting, funny, tragic and poignant.